If you were asked to pick three drivers from F1 as the quickest at the moment, it is likely that several candidates would present themselves to you immediately; these would probably include Kimi Raikkonen, Fernando Alonso, Lewis Hamilton, Nico Rosberg, Robert Kubica, Felipe Massa and Heikki Kovalainen. The more adventurous amongst us might include such names as Mark Webber and Sebastian Vettel. But one name would almost certainly be present in everyone's final top three - Fernando Alonso. There can be little doubt that Fernando deserves this assessment. He is probably the best combination of speed, consistency and racecraft of them all at this time and he remains the measure that assures us of Hamilton's talent. What he has been doing in the Renault R28 this year is ample proof that he has lost nothing of his ability and will to win after his McLaren adventure. The man achieves wonders with what is essentially a dog of a car. He also provides a daunting yardstick for his team mate this year, the disappointing Nelsinho Piquet (I will start calling him by the name he prefers, Nelson, when he lives up to his father's achievements). Before the season began, there were suggestions that Nelsinho might challenge Alonso in the same way that Hamilton did - but those dreams are long forgotten now, a third of the way through the season. It seems that Nelson's boy is falling flat on his face in spectacular style. Flavio Braitore has been much kinder in his public pronouncements on Piquet than he was to Kovalainen last year. While there are rumors that Nelsinho has been given three more races to prove himself (or what? ), the Flav laid into Heikki quite severely after only his first GP. Briatore has gone so far as to reiterate his support for Nelsinho and Pat Symonds has said that the lad is just lacking in confidence. It was that last that made me sit up and take notice. Lacking in confidence? Are we talking of the same guy who was all braggadocio and swagger last year? Unless that was overcompensation, I would say that confidence is the least of Nelsinho's problems. I will admit that I am particularly hard on Nelsinho since I was a fan of his father's from the beginning. Nelson was in much the same position in his first full year in F1, teamed with a double world champion who expected special treatment and proper respect, even when the rookie Piquet started to outqualify and outrace him. If Nelsinho cannot do the same, then away with him. To be fair, it must be admitted that much of Renault's effort is probably going into Alonso. Their star driver will have insisted on that after his experience at McLaren and Papa Briatore has made no secret of his preference for Fernando. So it is very unlikely that Nelsinho benefits from any of Alonso's settings and perhaps we should not be surprised that he was so much slower than his lead driver in the early races of the season. Nelsinho is gradually getting faster so he may be learning the game; the question of whether it will ever be enough remains, however. If the rumor of three races to make his mark is true, the likelihood is that Nelsinho will fail. Somehow I doubt that he will be replaced before the end of the season, even so - it is still true that he brings a lot of money into the team. It is more likely that the Flav has recognized his own failings in regard to his second driver and is prepared to give him a bit more attention for a while. But, if Nelsinho does not improve during that period, he will be a spare part for the rest of the year. It is an unenviable position to be in and few rookies would have been able to succeed in such circumstances. Formula One is a pitiless taskmaster, however, and will have no regrets if Nelsinho is ejected summarily at the end of the season. For he can expect no offers from more sympathetic team managers if he cannot hack it at Renault; the sport is over-subscribed with talented hopefuls and Nelsinho's disadvantages will not be taken into account (gone are the Ken Tyrrells and Eddie Jordans of this world who could see beyond a driver's apparent failure). To be honest, I think that F1 will be right in this case. Nelsinho is not the talent that his father was and there are brighter stars in the ascendancy. It would be nice if he were to prove me wrong, however. There’s a kind of arrogance on it.. Here in Brazil there´s a strange feeling around Nelson JR. He is not seen as a completely “Brazilian” driver (he was born in German), he seems to be away of the same mood in what we see Felipe or Rubens. This patriotic feeling here is something important to the he fans to support a driver. So, the fans are really hard on him too! I always read some opinions about Lewis be spoiled, but any driver in the grid has the support that Nelson SR gave to his child since the Kart days until GP2. Even Nico has the same support, but look what a driver he is. JR never needed to compete and challenge his team mate or challenge himself in a team without his father´s backing. Now, in Renault, is the first time. What I saw about Lewis is that he needed to delivery results to be backed by McLaren. I think this is one of the differences between both of them: the professional commitment! i have to admit to doubts about piquet-lite (i'm not as pc as some people) but reading this made me rethink it. last year i really wasn't impressed by kovalainen, though anyone who has to live under flav's influence gets my sympathy. i was really quite surprised to find myself warming up to him this year. i have to wonder if piquet, jr might have something, too. or does flavio bashing you just mean you've got something but aren't playing his game the way he wants it and flavio not bashing mean you're playing his game and are really just average? either way, i'm really ready for alonso to be topping the charts again. but, yeah, too bad for anyone who's his teammate. How can you say ALonso is the best all rounder when Lewis blew him out of the door with no experience whatever. For me it is absolutely clear that Lewis is the best on the grid. The number 2 seat at Renault is starting to look like the number 2 seat at Lotus in times gone by. Becken makes a good point about how Nelsinho and Lewis progressed through their careers. Piquet's father entered teams in every formula for him and the team was run for his benefit. There was no real threat of ever losing the backing. On the other hand Lewis had to hit his targets every year or he would have lost his backing and maybe his career. Yet there are still people saying he had the McLaren silver spoon treatment. Of course Red Bull, Renault and others have been dishing out silver spoons for years with no real benefit. So what does it say about Ron Dennis that he only needed one young driver in his program. I think Piquet senior should have had more sense than place his son at Renault. Becken: Thank you for the insight into how Nelson Jr is viewed in Brazil. Now that you mention it, I can understand how he is seen differently from the other Brazilian drivers. For the sake of his father, I still hope that Nelsinho can somehow succeed but he really does have everything stacked against him this time! It's a good point you make about Briatore too - who could possibly be adequate in the second Renault seat as long as the Flav and Alonso are together? Makes me feel sorry for Piquet-lite! Steven: How can I say that Alonso is still the best? Well, I guess it has to be thanks to the lingering doubt remaining over Lewis - there is that small matter of Alonso's settings, after all. I think there has to be some truth in the story that Hamilton had the benefit of Alonso's data (standard McLaren policy) and this season is the test of just how much that helped him. So jury close to decision but still out, I think. I could be wrong here, but I do think that Nelsinho does lack a bit of confidence, after a comment he made to us fans at the Oz GP after qualifying. I can't remember exactly what he said now, and it kind of endeared me to him that he would share a vulnerable part of his personality with his fans. That, and the fact that when I thanked him for his autograph he replied "No worries Mate" which is about as Australian as you can get, and I was really chuffed that he made the effort to learn the local vernacular ! I didn't really see too much of Nelsinho prior to F1 - I saw him in a couple of A1GP races and that was about it, so was never witness to the braggart you speak of. But I have some idea of the character of his father, and given how Snr has assisted Jnrs career all along, maybe Nelsinho is now realising that he does have feet of clay afterall, and that his name does not win races on it's own. Hopefully he can deal with the adversity. I will convert you to seeing Lewis as the best driver on the grid. I will. I doubt Lewis and Fernando could drive a car with the same settings. They are polar opposites in set up. Fernando likes the back end to be solid and the front to slide around where Lewis likes a solid front and the rear can go pretty much anywhere it likes. I think if Lewis got into a car with Alonso's setting he would be slow or crash out. Similarly Fernando would struggle in a Hamilton car for the same reasons. You are clearly softening your position but there are some people I read who give the impression that Fernando drove Lewis's car for him and any team mate would have similarly benefitted. This despite the fact that since he established himself no-one has been able to live with Alonso. Why hasn't Trulli or Fisi or Piquet scored the same number of points as him if he makes life so easy for his team mates? Pink Peril: Personal contact always alters one's perspective on someone, doesn't it? I am sure you are quite right in saying that Nelsinho appears to be a nice person - my comments on his apparent over-confidence are entirely based upon his public statements before the season began. I said that I was coming round to the opinion that he is the best but there is a little way to go yet. It was only a race or so ago that everyone was writing Lewis off, remember, and I continue to watch as the season progresses. The matter of settings is obviously over-exaggerated by the Hamilton hate brigade - Lewis would not have used Alonso's settings exactly for the reasons you state. But having the data would help him (in conjunction with his engineer) to avoid wrong directions for his own driving style and result in a faster arrival at a decent compromise. If that were not so, I fail to see why Alonso should have made such a fuss about sharing data. But whatever help the data-sharing issue is to a second driver, it can only be a minor factor on his performance on track - Lewis still had to get the job done on race day. So yes, I think he is very close to Alonso in ability, may even be ahead (and that with years of experience ahead of him to hone his talent even further), but it is still too early to declare him the best. Piquet Jr. should never have been awarded the Renault seat. we've got too many rookies who have been given a chance they haven't EARNED. They come with a name or they've won a minor series or they've brought some money, or maybe they are the 'team nationality' and management "rolls the dice". F1 doesn't need MORE regs but ........... two years testing or 25000kms in the logbook would save us from a lot of this disappoinment. Everyone has to be a rookie once but the threshold to the F1 grid ought to be higher. We need a full field of racers not a field of trainees. To be fair, Number 38, you must admit that many of last year's rookies are now proving their worth. Kubica and Kovalainen are looking especially good and Hamilton is leading the championship. While I agree that some do not really earn their entry into the sport, F1 will soon weed them out. Also, lengthy testing seems to dull rather than sharpen a racer's ability in F1. Piquet Jr is an example of this (I think he was a better racer before he tested for Renault in 2007), Kovalainen didn't seem to be helped any by it and Glock tested for Toyota quite a bit before racing for them. None of them appeared to find the first year any easier for doing so. Hear, hear, Alianora. And you thought process has been along much the same track as mine, it seems - as witnessed by my next article! Only a few more wet races and soon I think that we'll know that Lewis Hamilton is the greatest driver in the world. Kubica proved himself by substituting for an underperforming driver, although my memory is failing to recall that driver's name. He started to race regularly just as I was starting to really and truly watch things in F1. Kovalainen surprises me too, though there seems to have been very little adjustment made to the new car, either a testament to his skill or McLaren's engineering. Probably a little of both. I have the impression that Piquet, Jr. is being chosen because his parent was in the sport, and I feel the same way as I do for all the racing families in the US. They're largely unproven and may hinder new talent from rising. Didn't stop BMW from finding Kubica, though. I have left this same comment on other blogs when the issue of Piquet Jnr comes up, and I will say it here again. In those first 6 races, Heikki out-qualified Fisi 3 times, and beat him twice. Heikki had 3 points finishes by this point in the season and had 8 points. 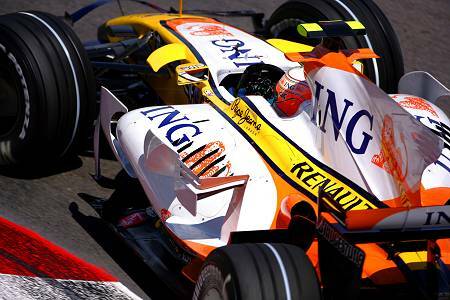 Heikki went on to score 30 of Renaults 51 points to help them along to finishing 3rd (in a bad season). To place well in a constructors championship requires both drivers to capitalize on race weekends and bag as many points as possible. At this pace, Renault have half a team and there is nothing in Piquets performance that suggests an immediate improvement. I hate to say it but I picked Nelson being a poor driver after Malaysia. He simply isn't comfortable or confident in the car and can't stand the pressure of a race weekend. With added pressure on him now, he is more likely to buckle further rather than improve. He has never ever had pressure applied to him in his entire racing career (the off-track type of pressure). Sponsorships will keep him in his seat though, which is a shame (making him essentially a pay-driver), as there are easily a half dozen good drivers who could do a much better job and bring the second Renault up into the midfield challenging for points. I have no problems with saying that Piquet is the worst driver on the grid at the moment, and not by just a little bit either. I was hardly using Heikki's F1 start as an excuse for Piquet's performance, Nik. In fact, I agree with you that he is unlikely to improve to the point where he becomes worth Renault hanging on to. The point I was making was the difference in treatment meted out to the two rookies over their first few races - Heikki was criticized in public but Piquet has been excused the bad races. The only reason I can think of for this is the fact that the money Piquet brings in more or less pays Alonso's salary. Alianora: Ironically, another "family" racer... I suppose they don't hold back talent after all... Then again, by then Jacques was calling it a career, he was not a young prospect anymore. Sorry Clive, I was referring to other posts, new stories and quotes that all referenced Heikki in 2007, not so much your own post. I know Briatore made the same comparison to the press at Monaco, and it just isn't right. It would be interesting to do a post about family lines in F1 racing and if they have been succesful or not. It just seems that at any time around 30% of the drivers on the grid are there not based on merit, but based on sponsorhip or family connections etc. I do recall that there wasn't a lot of confidence in Damon Hill when he first came out, nor for Jacques. There is no doubt that the skills required for racing (co-ordination etc.) can be inherited, but slotting Nelson Jnr into an F1 seat seems like a square peg fitting a round hole.